Carl Nielsen was not an organist though, as Bine Bryndorf relates in her excellent notes, he numbered many organists among his friends and pupils. His original music for solo organ all stems from the last three years of his life though it seems that the seeds of Commotio were planted a good few years before that. I wonder how well known his organ music is: I freely confess that all the contents of this SACD were new to me with the exception of Commotio. The organ on which this recital is played has been adroitly chosen. The St Nicholas Church dates back to the early 13th century but the church was all but destroyed in the Great Fire of Copenhagen in 1795; only the tower survived. Renovations did not take place until the early 20th century and then the rebuilt building went through a number of secular uses until it achieved its current status as an exhibition hall for art at the beginning of the 1980s. The organ was installed as a concert organ and, by a neat coincidence, it was inaugurated on the very day in 1931 that the premiere of Commotio took place, though that event happened elsewhere. It’s a three-manual, 44-stop organ built by Marcussen & Son and in the hands of Bine Bryndorf it sounds absolutely wonderful, especially as reported by the terrific recording produced by Eskild Winding and engineered by Clemens Johansen. Commotio is a complex composition but in this performance everything sounds crystal clear. There’s no muddying of the textures, all the strands in the fugal episodes register properly and when the organ is at full tilt the sound is magnificent – sample the power and majesty with which Nielsen’s writing comes across from about 7:50; hereabouts one can really appreciate the depth of the recording as the pedals provide a wonderfully firm foundation. Earlier in the piece I much admire the calm way in which Bine Bryndorf unfolds the Introduction, even when there’s a restless quality to the music. Commotio is surely a homage both to Bach and to Nielsen’s great Danish predecessor, Buxtehude. 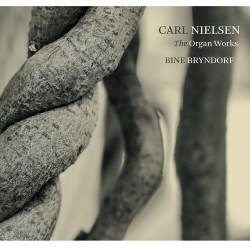 Though the music bears Nielsen’s own distinctive stamp it has its roots in northern Baroque organ music. In that connection I was struck by a sentence in Bine Bryndorf’s biography: “With Baroque as her stepping stone, she explores the entire spectrum of the organ repertoire.” Maybe it’s this grounding in the Baroque that makes her so persuasive and clear an exponent of Commotio. This performance lasts for over 23 minutes but, to be honest, it doesn’t feel like that: the first time I played the disc I checked the timing when the lively fugue begins and was surprised to find the performance had been playing for some 14 minutes. I think it’s an indication of Ms Bryndorf’s achievement that the music seems to unfold with a seeming inevitability – to the extent that any music by Nielsen is inevitable – akin to the music of Bach. The final short fugue (from 21:12) sounds jubilant here and the conclusion of the piece is sonorous and grand. This is a super performance of Commotio and the DaCapo engineering makes it sound resplendent. It seems from the notes that it’s possible that Nielsen conceived the idea for Commotio as early as 1913 to judge from a letter to his wife. This was after he’d attended a Copenhagen recital by the German organist, Karl Straube. He wrote: “I have the urge to write a fantasia for organ and have already begun.” Whether any of that inspiration found its way into the later masterpiece – his last major work – is unclear. The remainder of his solo organ output was apparently conceived toward the end of his life – the Festival Prelude for the New Century is actually a piano piece which has been arranged for organ by a number of people: Bine Bryndorf uses an arrangement by Finn Viderø and very imposing it sounds. The 29 Little Preludes for Organ were composed at the prompting of a Danish organist, Johannes Hansen. In fact it appears that the little Melody, CNW 97 was also part of the collection but Nielsen took it out of the set of Preludes prior to publication. Hansen urged the composition of the Preludes for liturgical use and their style chimes in with a movement in Denmark in the early decades of the twentieth century which strove for a new simplicity in worship. However, Nielsen subsequently suggested that quite a number of the Preludes – he specifically cited seven of them – were unsuitable for church use though at the same time he specified 12 as appropriate for liturgical use. They’re all quite modest in scale - only one lasts for a few seconds over two minutes and no fewer than 12 play for less than a minute. On the surface the music sounds quite straightforward but that’s not the whole story. In quite a number of the pieces quirks of rhythm occur which are typical of the composer – Preludes XXVI and XXVII are two examples of this. The very next Prelude begins broadly and sonorously but soon the music is throwing off decorative roulades of notes. A majority of the Preludes are quite modest and restrained in tone but some are more extrovert. These include Prelude III, which, despite its modest dimensions (1:07) is big-boned and festive. Prelude XII is noble and quite powerful. On the other hand many, like number XXIX, are gentle and thoughtful. I think Bine Bryndorf plays them imaginatively and well. Incidentally, the Two Preludes, CNW 98 are cut from the same cloth as the larger set. Very sensibly she doesn’t present the Preludes as an unbroken sequence. Instead they are divided into groups punctuated by a few of Nielsen’s songs. These are taken from his collection Salmer og Aandelige Sange (Hymns and Spiritual Songs). According to the notes this collection carries the subtitle ‘Nearly fifty melodies for homes, church and school’. As you might infer from the subtitle the style of them is fairly straightforward. The songs are strophic and communicate directly with the listener. In some cases – and this applies especially to the first three – the tunes have a sturdy, hymn-like quality. These melodies, all composed between 1913 and 1915, would definitely chime in with the drive for ‘new simplicity’ to which I alluded earlier. Previously unknown to me, I found all six of them appealing and attractive. Their appeal is magnified by the way in which baritone Torsten Nielsen sings them. He has a firm, clear voice and his performances are excellent. He comes over well in the recording – he is placed in the left-hand stereo channel while the light, modest accompaniment is heard from the right. This is a splendid disc and one that throws welcome light onto an under-appreciated area of Carl Nielsen’s output. Though Commotio is the masterpiece here and all the other pieces are slighter in comparison all the music on the programme is well worth hearing. Bine Bryndorf is a terrific advocate for the music, whether she’s playing it or writing about it, and the DaCapo sound is absolutely superb.